For the joy of old stone! Rod el-Gamra is a gem. A gem because it is small, even tiny, yet it features the typical archaeology that is found at ancient quarry sites. A gem because what was produced here, so-called naoi, are beautifully strewn in front of the quarry workings. And a gem because it has perhaps the oldest evidence of the use of iron tools in quarry operations in Egypt. But the Ancient Egyptians may not have been the first to quarry stone here, for the hard, volcanic stone show signs of having been worked for stone tools already by Palaeolithic man, tens of thousands of years ago. Located in the middle of the Eastern Desert, this tiny quarry, found by James Harrell and his team in 1998, was in use over a short period in the 30th dynasty (380-343 BC), just before the second Persian invasion of Egypt. In fact, it may have been the invasion that led to a hurried abandonment of the quarry – thus this could be the reason why there are many almost finished naoi left at the site. Naoi are stone “boxes” which were placed in temple sanctuaries from the Middle Kingdom onward, typically to hold a statue of the god to which the temple was dedicated. The greenish dolerite porphyry at Rod el-Gamra is an extremely hard volcanic rock and there is ample evidence that the naoi were quarried by the use of iron tools. Though iron tools may have partially replaced the good old stone and bronze tools of the Ancient Egyptians at a slightly earlier date, Rod el-Gamra provides the earliest, pretty hard evidence: The stone boxes are too hard for chiselling by bronze tools and there can be little doubt that the extraction from bedrock was done by iron wedges. Thus, the quarry is a sort of a forerunner for the gigantic Roman quarry operations in the Eastern Desert and elsewhere in Egypt a couple of centuries later. In addition to the small quarry workings, and the abandoned naoi, the site features a number of small stone huts, fragments of pottery (which gives the date of the quarrying), pieces of slag (which indicate the existence of a smithy) and a mysterious ring of stone at an elevated place. Though speculative, this circle may have had religious purposes. Anyway, these are the basic elements of a desert quarry site in Egypt: Extraction spot, workplace for the produced objects, huts for provisions and resting, tool production places and places for worshipping the gods. What is missing at Rod el-Gamra are loading ramps and cleared or paved roads to bring the quarried objects back to the Nile Valley. 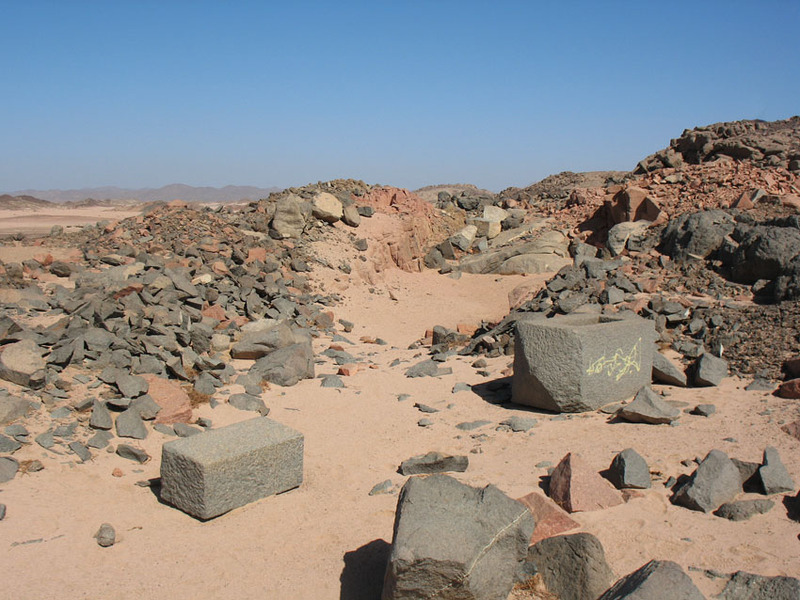 But the naoi weights only up to 2000 kg and the desert surface is hard, so there was no need for infrastructure to load stone onto carts and for driving to the nearest ancient desert road connecting the Nile Valley with the Red Sea. 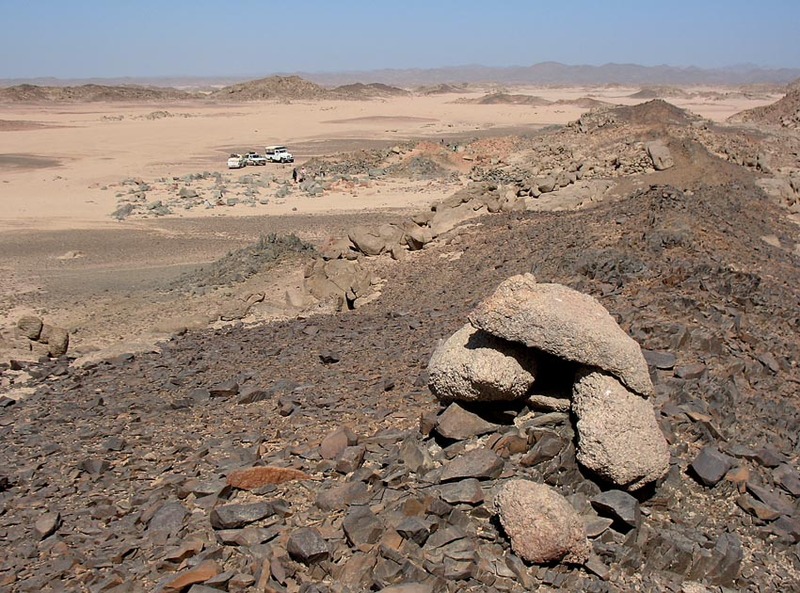 The Precambrian rocks of the Eastern Desert have been highly renowned as resources for natural stone, gemstone and metals (gold) for more than 6000 years. Egypt would not have been as we know it without the Eastern Desert! But there is more: It is well-known that flint and quartzite (silicified sandstone) along the Nile Valley was heavily used for stone tools by Palaeolithic man, starting several hundreds of thousands of years ago. Not so for the Eastern Desert. We are only beginning to see the traces of Palaeolithic stone procurement in this vast desert landscape. And there may be some traces also at Rod el-Gamra. For the main volcanic dyke at the site features a diabase(?) that may very well have been exploited more than a hundred thousand years ago, for cleavers and handaxes. These are unverified observations, made on a visit with Karen van Opstal in 2006. Unverified or not, Road el-Gamra, now in the middle of a vast desert expanse, is for some hostile, for others a dream of emptiness and loneliness. In different climates than today’s hyperaridity, it was neither hostile, nor empty, nor lonely. It was teeming with life. Harrell, J.A. 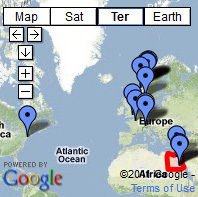 2002 Pharaonic stone quarries in the Egyptian deserts. In Friedman, R. (ed.) Egypt and Nubia—Gifts of the Desert, British Museum Press, London, pp. 232–243. I work with the archaeology of old stone quarries, monuments and rock art. And try to figure out how they can be preserved. For us - and those after us. For the joy of old stone! This entry was posted in Ancient Egypt, Archaeology, Old quarries and tagged Ancient Egypt, ancient egyptian quarries, quarry, Rod el-Gamra, ten quarries of ancient egypt. Bookmark the permalink. Tjenester for kulturminnevernet: Hva gjør en geoarkeolog for steinbygninger, steinbrudd og bergkunst? SOAPSTONE! 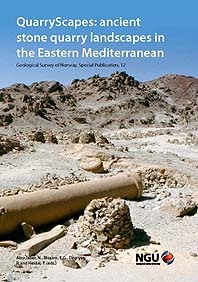 New book on its archaeology and history! 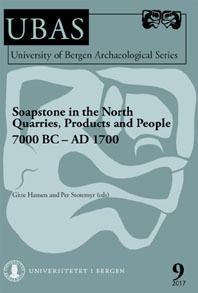 Per Storemyr Archaeology & Conservation by Per Storemyr is licensed under a Creative Commons Attribution-NonCommercial-NoDerivatives 4.0 International License. Unless otherwise indicated, all content should be attributed to www.per-storemyr.net. Reuse of images by Per Storemyr requires permission.